Northeast Pump & Instrument Co. Specialist design, sale, installation, repair of chemical feed equipment, systems and instrumentation for the water treatment industry. manufacturer of quality flow indicators, flow meters, flow switches, rotameters, variable area flow meters and flow controls to the industrial, manufacturing, municipal, commercial and o.e.m. markets. manufactures flow meters, flow monitors, flow computers and customized flow control products. positive displacement and turbine flow meters, flow monitors, two-component ratio monitors and state-of-the-art closed-loop controllers, fiber-optic sensors, on-line optical sensors. distributes digital flow meters including teflon, liquid, mass gas and turbine flow meters. Manufacturer of flow meters, HMI software, industrial PCs, flow computers, rate meters, counters, timers, and various types of industrial measuring and sensing equipment. inline turbine meters, insertion turbine meters, remote mounted low power flow computers, custom designed communications systems, panel mounted flow computers. a thermo instruments systems company. specializes in flow related products including standard & specialty flow meters. manufactures flow meters and monitors, flow computers and other customized flow control products. manufactures industrial flow meters, flow switches, and flow instrumentation with calibration services. turbine flow meters and custom designed flow measurement systems for users in the automotive, aerospace/defense, process/manufacturing and metrology industries. flow meters useful for hydro-electric plants, low head dam flow measurements, turbine efficiency, spillway discharge measurements, and flow monitoring at short intake power plants. flow meters for low head dam flow measurement, spillway discharge measurement, flow monitoring, hydroelectric industry. offers compact digital mass flow meters, digital gas meters and oem mass flow sensors. manufacture of flow meters and water meters. Manufacturers flow meters, liquid level gauges and sight flow indicators. distributor of large diameter flow meters, magnetic flow, propeller and venturi/v-cone. manufacturers flow switches and flow meters for industrial cooling systems and weldsavers for cap off detection on robotic welders. buy and sell new and surplus flow meters, flow conditioners, and instruments as well as hard to find replacement parts and specialty tools. manufactures differential flow measurement and control products, including venturi meters, orifice plates and meter runs, and flow nozzles. Manufactures corrosion-resistant plastic fluid flow valves, pipes, pneumatic and electric actuators, vortex flow meters and backwashable filters. distributor of pressure switches, pressure transducers, vacuum switches, level switches, flow switches, flow meters, flow indicators and temperature switches for processing industries. calibration firm performs all types of gas flow, applications of flow controllers and meters. manufactures water and wastewater treatment products, including submetering, multi-jets, electromagnetic flow meters, liquidmaster, flow controllers, automatic meter reading systems. calibration and testing for the water and wastewater industry. serving ohio, kentucky, indiana and beyond. flow meters, pressure transmitters, differential pressure transmitters, ph, temperature, the meters and control people. supplies process and industrial controls including pressure, temperature, flow and level switches. flow meters, level measurement, non return valves and pinch valves. manufactures thermal mass flow meters for industrial gases, combustion air, flue gases and other applications. also, mass flow control valves, inline elements, transmitters. manufactures liquid and gas flow sensors, meters, and controllers. specializing in teflon liquid flow sensors and controllers for cmp, uhp. automatic sampling systems and ultrasonic flow meters. If the business hours of Northeast Pump & Instrument Co. in may vary on holidays like Valentine’s Day, Washington’s Birthday, St. Patrick’s Day, Easter, Easter eve and Mother’s day. We display standard opening hours and price ranges in our profile site. We recommend to check out npipump.com/ for further information. 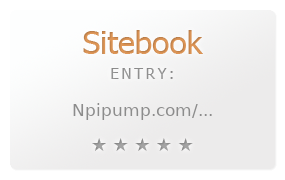 You can also search for Alternatives for npipump.com/ on our Review Site Sitebook.org All trademarks are the property of their respective owners. If we should delete this entry, please send us a short E-Mail.